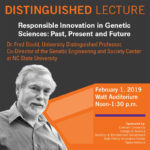 Clemson University, Feb. 1, 2019 | Dr. Gould has served on National Research council committees, addressing regulation of genetic technologies in agriculture. Dr. Gould received the Alexander von Humbodlt Award for most significant agricultural research over a fiver-year period, the Sigma Xi George Bugliarello Prize for written communication of science, and the O. MAx Gardner Award in 2012 for being the UNC faculty member with the greatest contribution to human welfare. He was elected to the US. National Academy of Sciences in 2011 and serves on the National Research Council Board on Agriculture and Natural Resources. 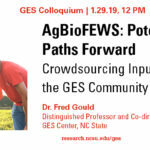 GES Colloquium, 1/29/19 – Fred Gould | The GES Center is launching our new NSF-funded Research Traineeship, Agricultural Biotechnology and Our Evolving Food, Energy, and Water Systems, or AgBioFEWS. We are in the process of recruiting our first cohort of students and designing details of our courses. 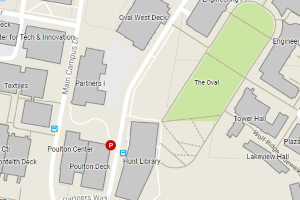 We would like to use this colloquium to get feedback from students on faculty on a choices that we will be making. 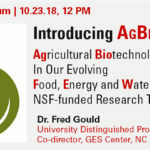 The GES Center has received a National Science Foundation funded research training grant to launch AgBioFEWS, or Agricultural Biotechnology in our Evolving Food, Energy, and Water Systems. Fred will be discussing the program activities, goals, and rollout plan. Note: This colloquium will not be live-streamed, although we will be filming to include footage in the program’s recruitment video. We kindly ask that attendees this week avoid wearing clothing with large logos or potentially distracting graphics. Thank you! 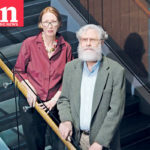 Scientists who refuse to engage with ethicists and the public will find themselves at a disadvantage. 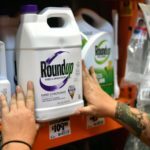 “Just because you are a scientist and have invented something doesn’t mean you have authority over it,” says Fred Gould, an entomologist and co-director of the Genetic Engineering & Society Center at North Carolina State University. He points to the National Academies report’s advocacy of participatory decision-making. Resistance from the science community based on ethicists and the public not fully understanding the science wears thin, he says. “You are a pretty poor scientist if you can’t explain what these things are about to an ethicist,” he says.